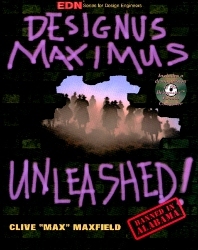 Designus Maximus Unleashed! is more than a collection of article reprints; in this book, the original (unedited) text is revisited, along with new insights and previously unpublished material, all presented in the author's distinctive personal style. The accompanying CD-ROM includes a fully-functioning virtual computer, as well as BOOL Logic Synthesis, MMLogic Multimedia Logic Design System, and Analog Magic. Clive Maxfield, a popular columnist, has collected his articles in a new order, grouped by topic, and expanded from the limits of magazine space. These articles have been published in magazines such as EDN, Electronic Design, and Electronic Design & Technology. In addition, he includes new material such as the history of computing, logic design tools, and the virtual computer. Two chapters of personal perspective begin and end the text. Clive 'Max' Maxfield received his B.SC. in Control Engineering from Sheffield Polytechnic (now Sheffield Hallam University), England, and began his career as a mainframe CPU designer. He is currently a Member of the Technical Staff at Intergraph Computer Systems, Huntsville AL. In his spare time, Max is a contributing editor to EDN magazine and a member of the advisory board to the Computer History Association of California. In addition to numerous technical articles and papers, Max is also the author of Bebop to the Boolean Boogie and the co-author of Bebop BYTES Back (An Unconventional Guide to Computers). Clive "Max" Maxfield received a BS in Control Engineering from Sheffield Polytechnic, England in 1980. He began his career as a mainframe CPU designer for International Computers Limited (ICL) in Manchester, England. Max now finds himself a member of the technical staff (MTS) at Intergraph Electronics, Huntsville, Alabama. Max is the author of dozens of articles and papers appearing in magazines and at technical conferences around the world. Max's main area of interest are currently focused in the analog, digital, and mixed-signal simulation of integrated circuits and multichip modules.